I cant even begin to imagine the pressures that Ozzy had in replacing the horribly departed Randy Rhoads and his extremely demanding boots and plectrums to play guitar on the follow up for two excellent records, Bark At The Moon. In this view a whole lot of respect must be given to Jake E Lee, who not only manages to pull off the daunting task, but also brings in his own, distinct style. Sure, he isn’t the same classical übervirtuoso that Randy was, but his whole approach is different. Lee´s playing is much more blues-based and rock-oriented, and it fits the albums hard rock vibe well. Despite the change in guitarist, bark is plagued by the same key weakness that was hinted on Diary – very jumpy song quality. The opening title track is a magnificent up-tempo rocker with great choruses and Lees sizzling lead work blasting on full speed. 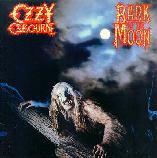 Bark At The Moon easily trumps any other song on the disc. Youre No Different and Now You See It (Now You Don’t) boast infectious choruses but as a whole are OKcompositions at best. Rock N Roll Rebel shakes some excellent leg and Centre Of Eternity has some nice riffs and lead melodies, but the atrocious chorus ruins the song for me. On Blizzard and Diary, the ballad department was in excellent form, with Goodbye To Romance and Tonight respectively. On this one, Bark At The Moon suffers its greatest downfall. So Tired is simply horrendous – in terms of what Ozzy has been capable of even on latter albums. The song isn’t bad per se, just utterly boring. On the other hand, the title of the song is nearly perfect. Judging by the vocal performance on the tune, Ozzy was most definitely So Tired. Slow Down thankfully even lifts the tempo as to rattle the bad taste of the previous song, but it still isn’t that great, although in almost direct mirror image of Centre Of Eternity, the chorus is a real stand-out element, along with Jakes great solos. Waiting For Darkness ambitiously tries to reach the giddy epic heights of Diary Of A Madman, but mostly falls flat halfway. My re-mastered edition also has a bonus track, Spiders In The Night, which is simply put slow and painfully dull. Had they not included this garbage in the end, I might have scored over 70, but not this time, padre. The production values are very alright in all areas, although the one little detail that really hits me is that Jakes guitar sound is nowhere as killer as Randys razor-like devastation. All in all, Bark At The Moon was a demanding test of will, after the loss of a very unique and vital band member. In this respect, Bark At The Moon does the job, not looking for a Randy-clone, but opting for Jake with his own style. What they unfortunately forgot to do, however, was write more good songs. The album has its moments, but is one of the weaker releases in Ozzys illustrious solo catalog.